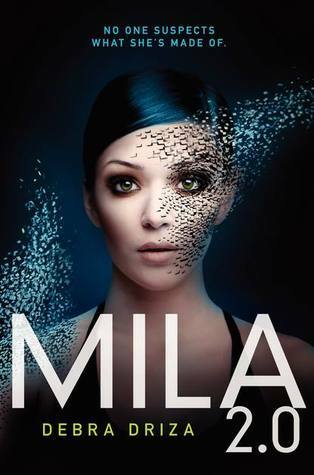 Mila 2.0 has an awesome premise and is, in actuality, merely an okay-ish book. The beginning is terrible, but once the action starts, the story gets a lot more exciting. First off, why is it nearly 500 pages long? You could've chopped off a quarter or a third of the story and it would've flowed a lot better. I think the first 150 pages should have been shortened - that's what I really had trouble with. It starts off with lots of clichés: Mila and her mom have recently moved to a new town, Mila has a very overdramatic and irritating best friend, and Mila immediately falls in love with this cute new guy at school. UGH. What annoys me most about this is the fact that, in these first 100-ish pages, the story is set up so that you think it's along the lines of a contemporary, and that characters like her best friend, Kaylee, and the love interest, Hunter, are going to have an important role in the story. But instead, Mila and her mom have to escape some bad guys and spend the rest of the novel on the run. So what was the point of all those pages about school, friends, etc., when it has nothing to do with the rest of the story? So yeah, I was a little disappointed that the action doesn't begin until a third into the book. Yup, the first action scene in this "thriller" actually takes place after 150 boring pages of drama. I don't think this book really qualifies as a thriller. Thankfully, the story does pick up after the first third. Like I said in the beginning, once the action starts, the pacing improves, there's more sci-fi type stuff and fight scenes, and it finally starts feeling like an action book. So yes, there are eventually some fun twists and action. And we get some characters, like Lucas, who are actually interesting and not stereotypical(*coughcough* like Kaylee). And I do like the relationship between Mila and her mom. My only other issue is that I found Mila to be a little too bland and hard to connect with at times. Sure, I was entertained by the fun action scenes in the second half, but I was never really rooting for Mila. This would be a totally negative review if not for the second half of Mila 2.0, which I do think is a LOT better than the beginning. That's enough for me to bump up the rating a little. Still, I'm probably not interested in reading the sequel, unless the reviews for it are really good.